You don’t have to travel far for a romantic getaway. Plan a staycation to start your marriage off right. With all the attention to your wedding day, you might almost forget about what comes next. But your honeymoon isn’t just another vacation: It’s the start of your marriage and one of the most special trips you’ll ever take. But you don’t need a huge budget or even a passport to have the honeymoon of your dreams. Here are a few locales in Wisconsin that make a perfect point of departure for your new life together. Stay: Look no further than the Blacksmith Inn on the Shore—this B&B should be in the encyclopedia under “romance.” Cozy porches, shoreline views, and in-room fireplaces and whirlpools make for the perfect post-nuptial rendez-vous. Sleep in before enjoying breakfast in bed together and checking out all that Door County has to offer. Eat: The picturesque Wickman House offers delicious fare, perfect for a leisurely dinner before retiring to your B&B. The menu is sourced with fresh ingredients grown in the backyard garden—about as authentically Wisconsin as you can get. Do: Rent a tandem bike and pedal along the shore or take a kayak out and explore the water. Don’t forget to cuddle up by the fire or enjoy a good old-fashioned fish fry. Depending on the time of year, look into snow-shoeing, cherry picking or a candlelit nighttime hike. Stay: Grand Geneva Resort & Spa is a must for anyone visiting this fabled resort town. Nestled on a spacious 1,300 acres and boasting a comprehensive spa, Grand Geneva Resort & Spa is a little slice of luxury in southeastern Wisconsin. Eat: Ristoranté Brissago offers “a contemporary take on traditional Italian cuisine.” The upscale dining venue flies in ingredients like cheese and wine from Italy and focuses on seasonal specialties. You may not be in Rome, but that doesn’t mean you can’t dine as if you were. Do: Stay put on Grand Geneva’s grounds for activities including massages, tennis, golf, or a seasonal activity like fishing, skiing or a cozy autumn hayride. If you’re ready to venture forth, wander into downtown Geneva to browse the charming shops, or take a tour with the Lake Geneva Cruise Line. The resort also provides trolley tours of the town. Stay: The Inn at Lindwood in Minocqua is a cozy retreat on Inkpot Lake. It’s located near the waterfront, with lots of that cozy north woods vibe. If you’re looking to get away from the rest of the world, northern Wisconsin is your perfect retreat. Eat: Norwood Pines Supper Club features a typical supper club menu, with a secluded porch and views of Patricia Lake. Deer frequently wander by the porch, so you might even spot a piece of Wisconsin wildlife while enjoying cocktails and a meal. Do: Lakes abound in the north woods, especially the Minocqua area. Rent a boat or simply sit on a dock and embrace the beauty of the waterfront. Downtown Minocqua also features plenty of cute shops. Check out the Bearskin State Trail for a gorgeous nature hike. Stay: If you want that big-city vibe for your honeymoon, downtown Milwaukee’s Pfister Hotel will suit you. The 125-year-old Pfister is an iconic luxury hotel with spectacular architecture; from gorgeous amenities to a full-service spa and salon, you’ll feel truly pampered during your stay. Eat: Split a few small plates at Odd Duck, a locally sourced restaurant in the heart of Bay View. Nothing says romantic like trying a few adventurous dishes together and sharing dreams for your marriage over an appetizer or two (or five). You could also head up to the 23rd floor at the Pfister and enjoy Blu, the hotel’s martini bar that features panoramic views of the city. Or if it’s a sunny afternoon, visit the Harbor House patio, which overlooks Lake Michigan. 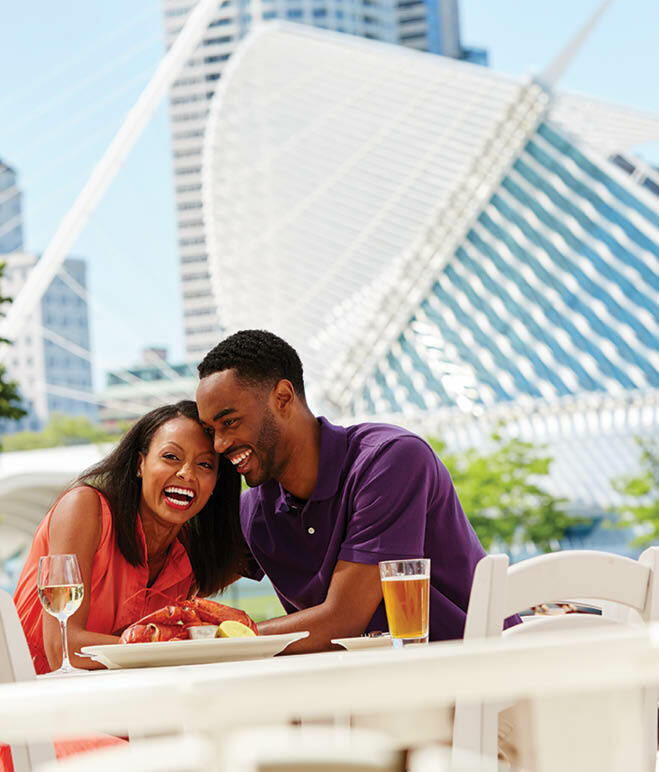 Do: Hop on a Lake Michigan boat cruise for a dreamy sunset spin or check out the Milwaukee Art Museum for the first of many date nights. Stroll around the Historic Third Ward at night to try a new bar or just take in the feel of the city. Stay: Old Rittenhouse Inn in Bayfield is the spot for the honeymoon of your dreams. In-room whirlpool tubs and fireplaces, along with Lake Superior views, will put you both in that special mood. Kick things up a notch with the Romance Package—fresh flowers, chocolate-covered strawberries and sparkling wine on arrival. Eat: Stay at the Rittenhouse and check out their Landmark Restaurant, an upscale fine-dining eatery with French cuisine and Victorian ambiance. The wraparound porch is the perfect place to enjoy a pre-dinner drink or scrumptious dessert. Do: You can’t go to the Apostle Islands without going on a sea cave tour. The Bayfield Maritime Museum is also worth your time. From rock formations to historic lighthouses, the beauty of the area will remind you again and again of the wonders of Wisconsin. It can be tricky for couples to fit a honeymoon into their budget. Here are a few tips for making things as financially friendly as possible. Don’t go too far from home. Choose a location that isn’t going to require a lot of time off work or expensive plane tickets. Instead of registering for china or cookware, ask wedding guests to donate to a honeymoon fund. Figure out which aspects of your wedding day are least important to you and put that money toward a honeymoon. Inquire about honeymoon specials or deals at your dream venue. Focus on free. Romantic walks, cooking dinner together or snuggling up with a movie can be just as fun as activities that cost money. Go during the off-season. You don’t have to go on your honeymoon right after your wedding for it to be special. Book as early as possible. Many hotel rates increase the closer you get to your stay. 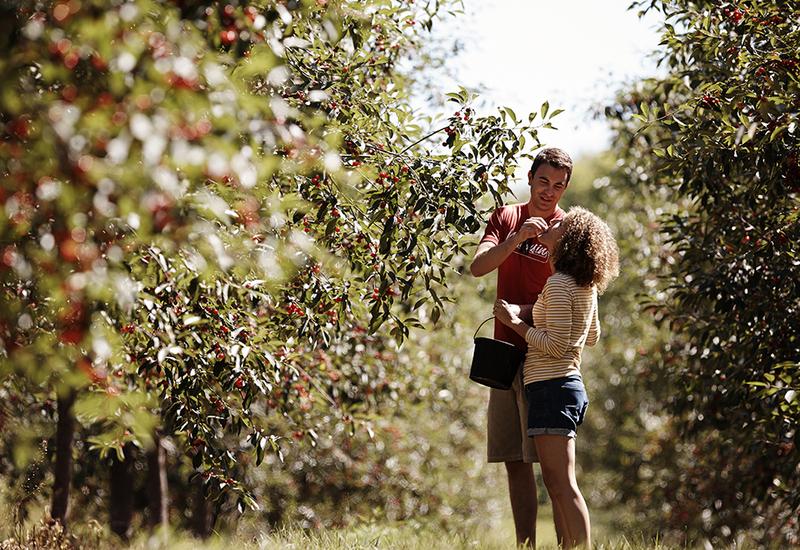 Door County offers a charming, scenic destination for wedding-weekend bliss.